Traditional Turkish kebabs are nigh-on perfect. Whether you prefer shish, kofte, doner, iskender or beyti, the smoke and sizzle of a charcoal mangal is hard to beat. The wisest restauranteurs know better than to attempt ‘elevating’ or ‘refining’ these timeless classics, but instead attempt to put their own personal spin on them whether through unconventional meats, preparations and/or accompaniments. 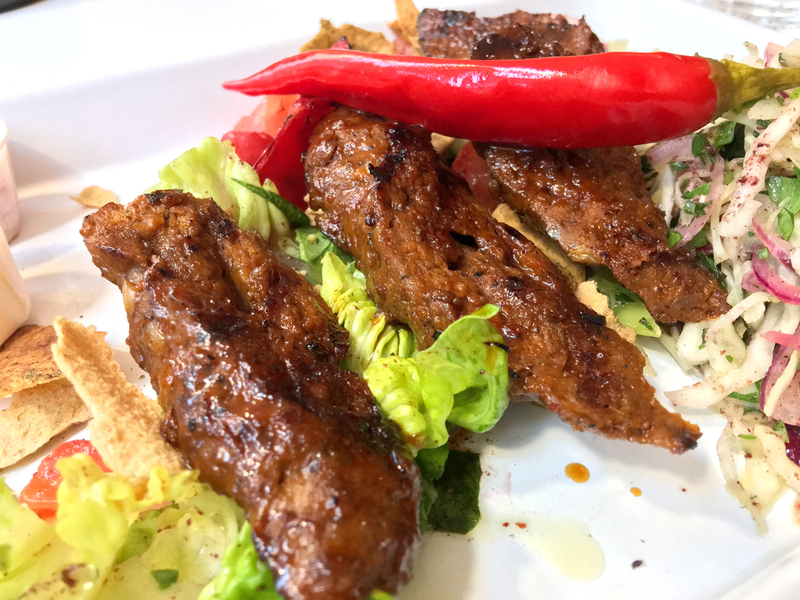 Comparing gussied-up kebab eateries Bababoom and Maison Bab, the former in Islington and the latter in Covent Garden, is so natural that it seems almost preordained. Both are the second branches of feted originals (Maison Bab is the sequel to pig face purveyors Le Bab) and both opened at the same time. 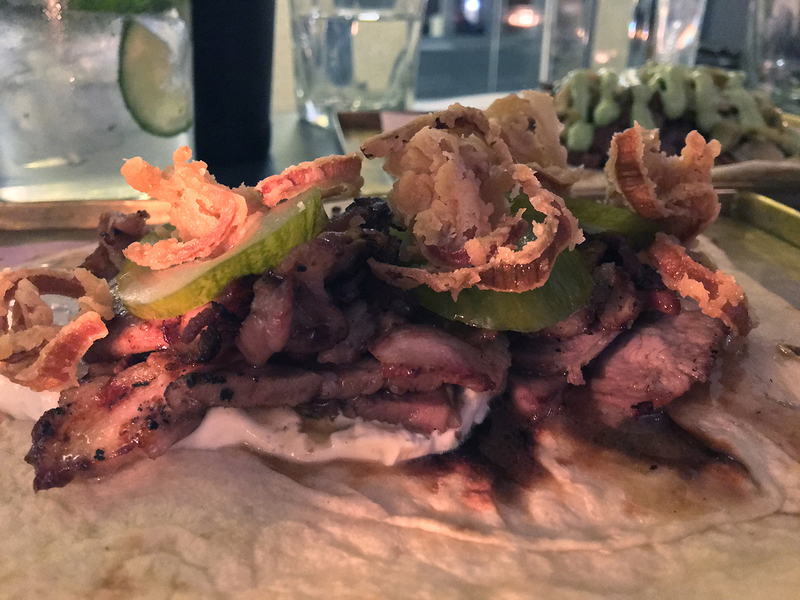 I haven’t eaten at the original Bababoom, but that first location had the modest advantage of being located in Battersea – comparatively far from the mangal strongholds of north London. The second Islington branch, on the other hand, is almost within spitting distance of Green Lanes and its many meaty delights. This is either brave or foolhardy. My experiences suggests that it’s both. 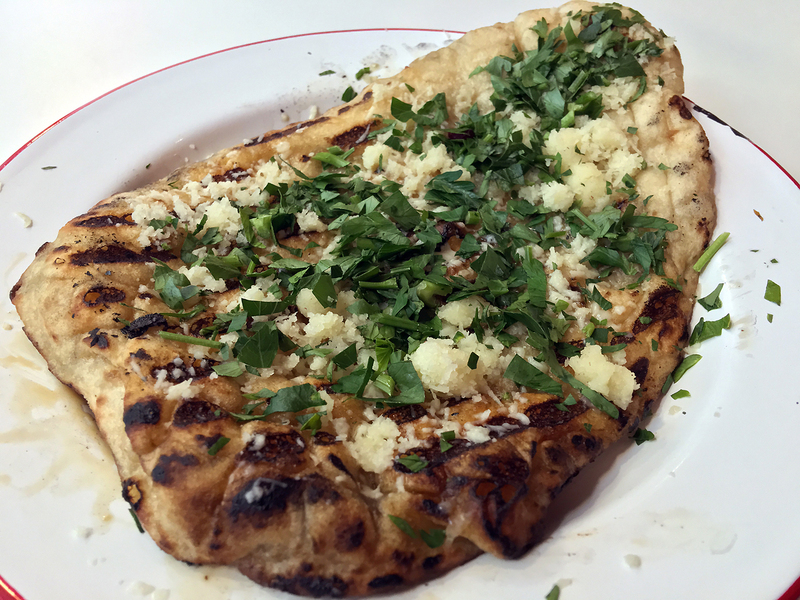 Although Bababoom’s garlic flatbread used mashed garlic and parsley, rather than garlic butter, garlic puree or some sort of reduction, it still imparted a reasonably strong level of moreishness. 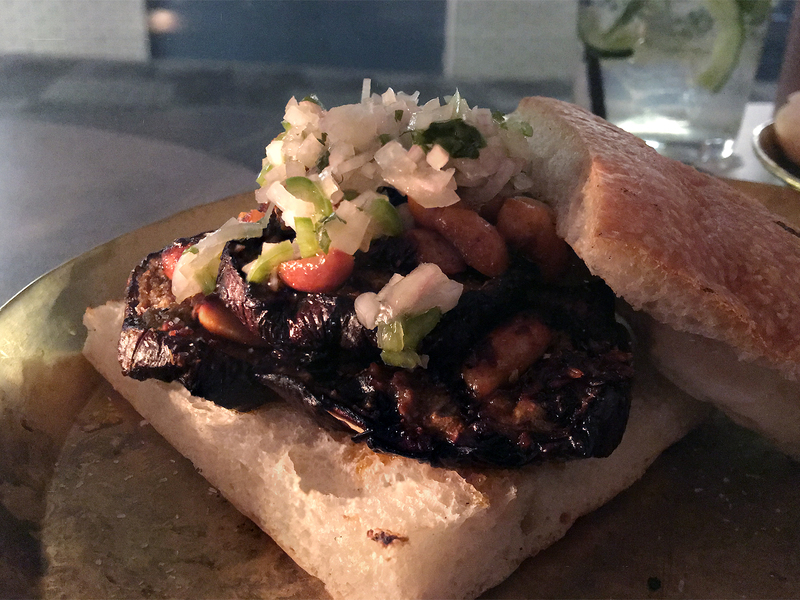 There was no faulting the bread itself – soft and elastically tearable with charred, smoky edges. 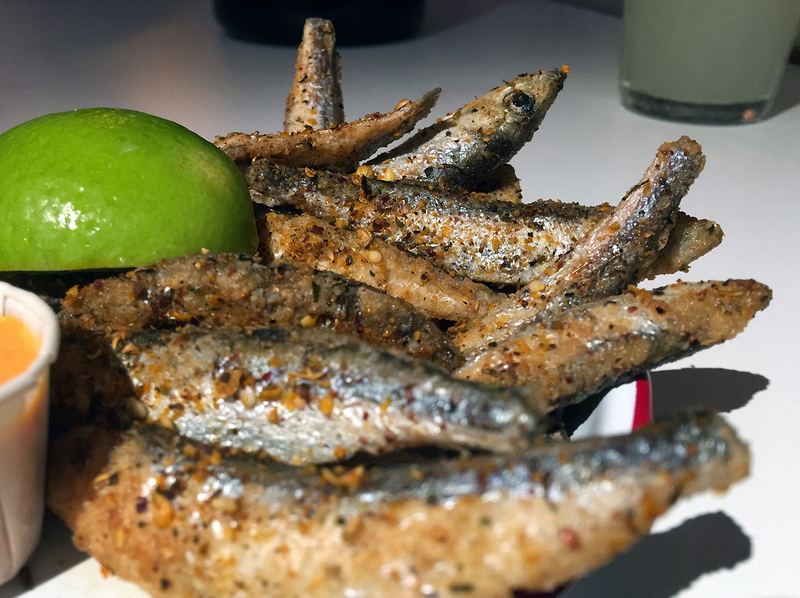 As expected, the whitebait had little to say for themselves and were merely a carrier for the lightly crispy batter. Its genteel crunch was joined by a dusting of dukkah which was only moderately aromatic, but its fragrance was still just enough to lift this up above other, far more ordinary battered whitebait dishes. 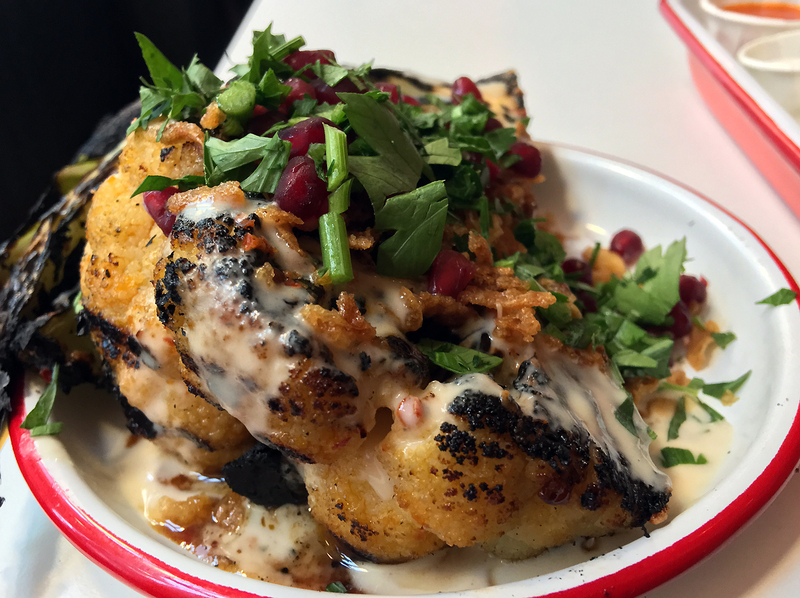 A firm chunky quarter of charred cauliflower was evocatively blistered, but was ultimately unmemorable due to the lacklustre dusting of pomegranate and the meagre dribbles of sauce which were, at least, mildly moreish. It looks pretty, I’ll give it that. 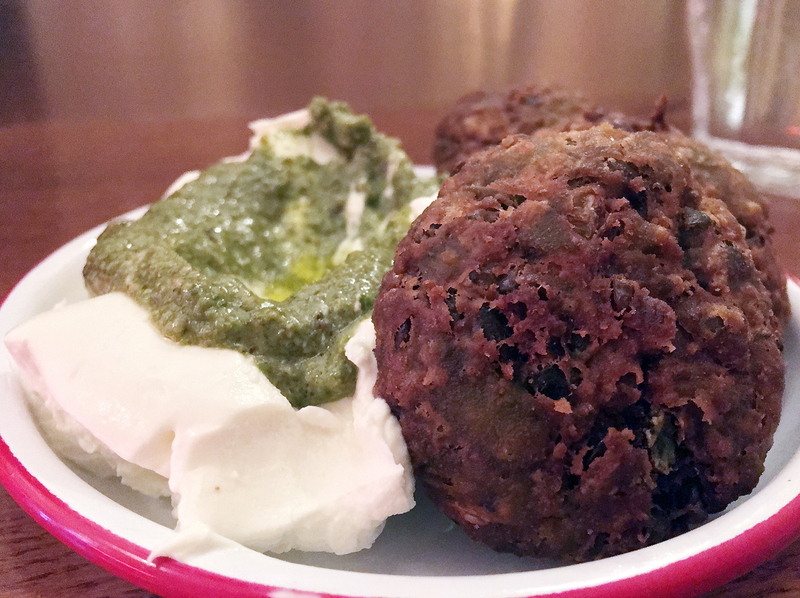 When sliced in half, the broadbean falafel looks a bit like a mushy pea fritter. If that idea doesn’t set your tail wagging, then there’s little hope for you and you might as well scuttle off to the big doggy playground in the sky right now. 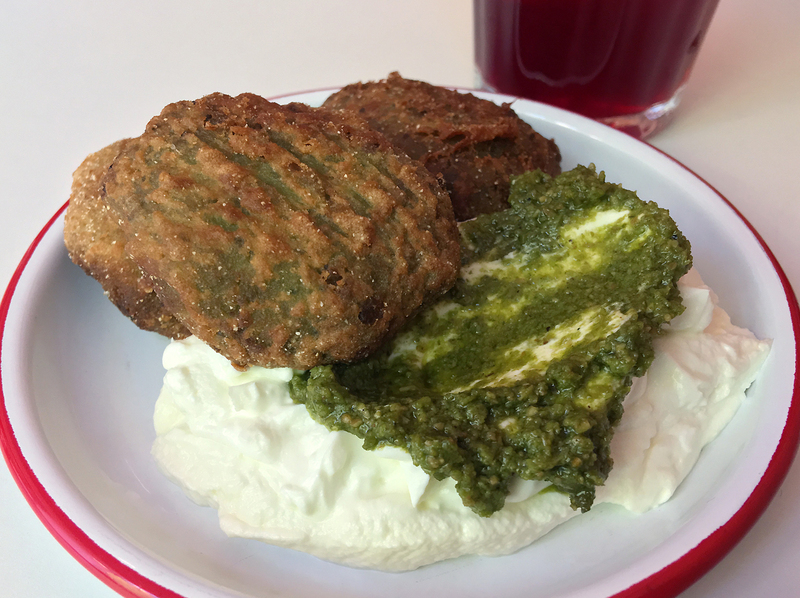 The crunch of the smooth, oil-free batter coating and the gently creamy, moreish legume filling inside were a classy combination – even more so when taken with thick labneh-style yoghurt. Falafel can be a surprisingly broad church. 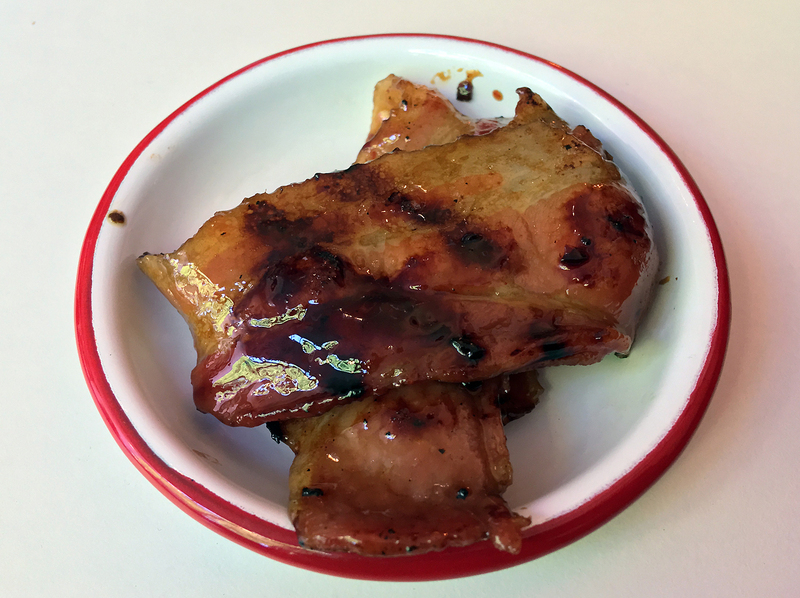 Fatty strips of American-style belly bacon had a sugary, musky glaze made from reduced dates. Bacon is already so wonderful that it rarely needs any embellishment, but this was as good a flourish for bacon as you’re ever likely to find. Six degrees of date-glazed bacon. 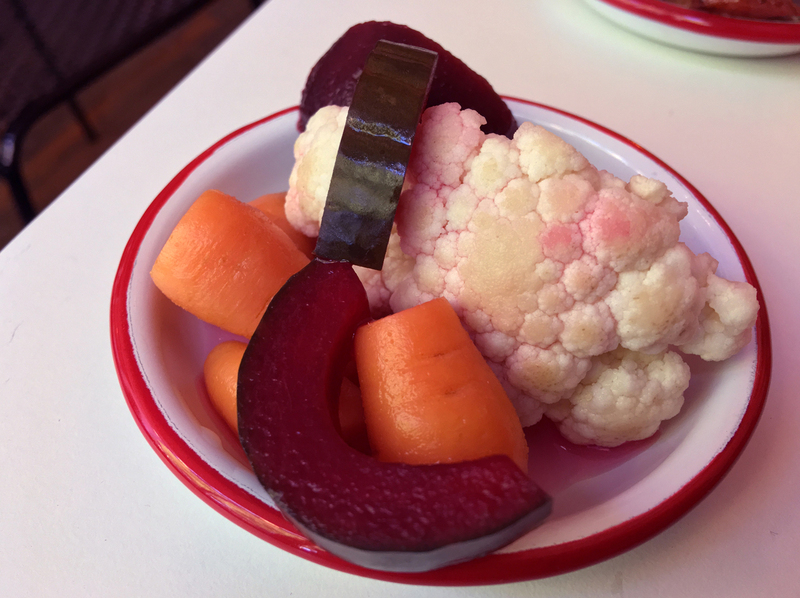 Earthy beetroot, surprisingly tart and springy cauliflower as well as sweet carrots made for a fine selection of palate cleansing pickles. Whatever happened to Eric Pickles? 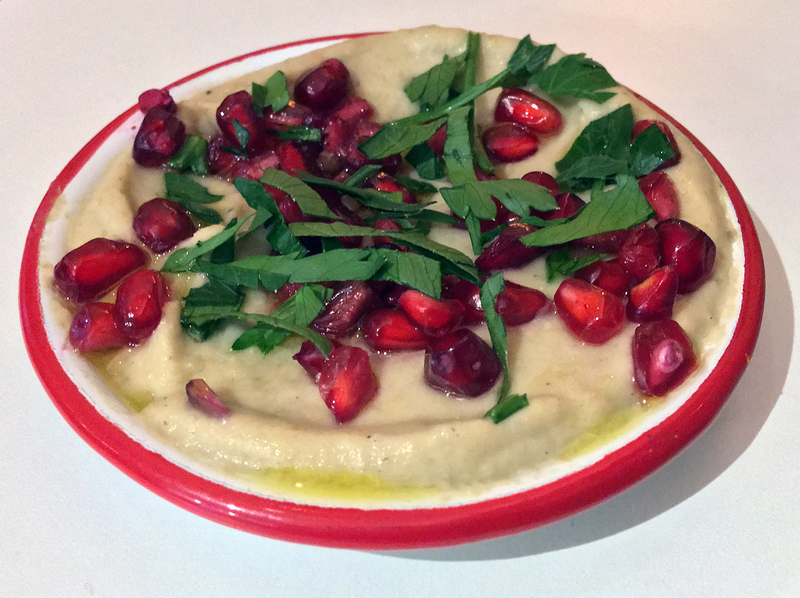 Crunchy pomegrante was the unwanted partycrasher obscuring the already faint charms of the baba ghanoush. The pureed aubergine wasn’t especially silky or smoky, with the usually bold and brassy aubergine flavour a meek wallflower. The miniature chipolata sizes of the merguez meant it was difficult to appreciate the coarse, dense meatiness of these pork-free sausages. Disappointing. 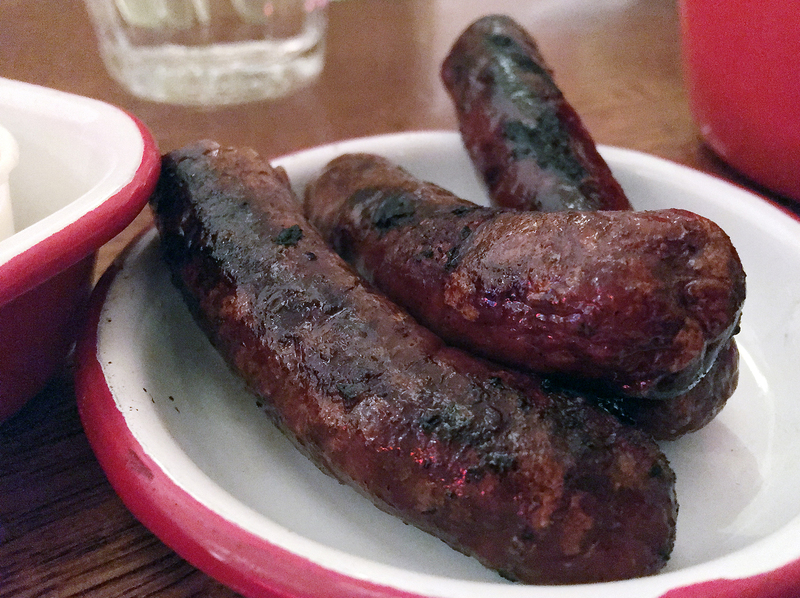 I shall call them… Mini Merguez. Avocado tahini is a curious sounding concoction, but the mundane reality consisted mostly of lightly mashed avocado and – at best – modest amounts of tahini. Tahini. It’s a magical place. 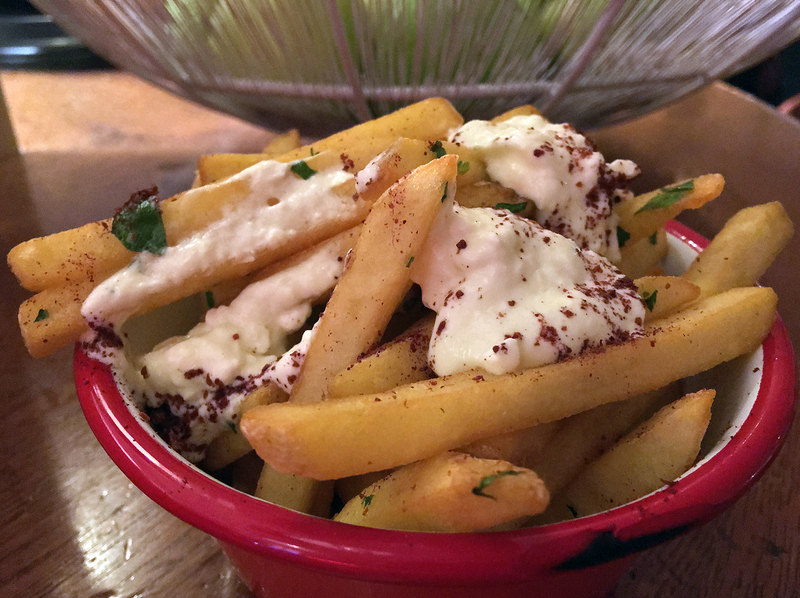 Whipped feta fries were utterly unconvincing from the thin, unexceptional potato weeds to the blankface cheese whip spewed on top. Why fries instead of proper chips? I wouldn’t have known that the beef kebab had been made from brisket if I hadn’t been told. The grainy, anonymous lozenges of meat resembled lacklustre lamb koftes more than anything else and certainly had none of the mouthfeel of a really good brisket. It wasn’t a complete loss – it had a mild fruitiness and was reasonably moist, but it still made for a disappointingly dull kebab. 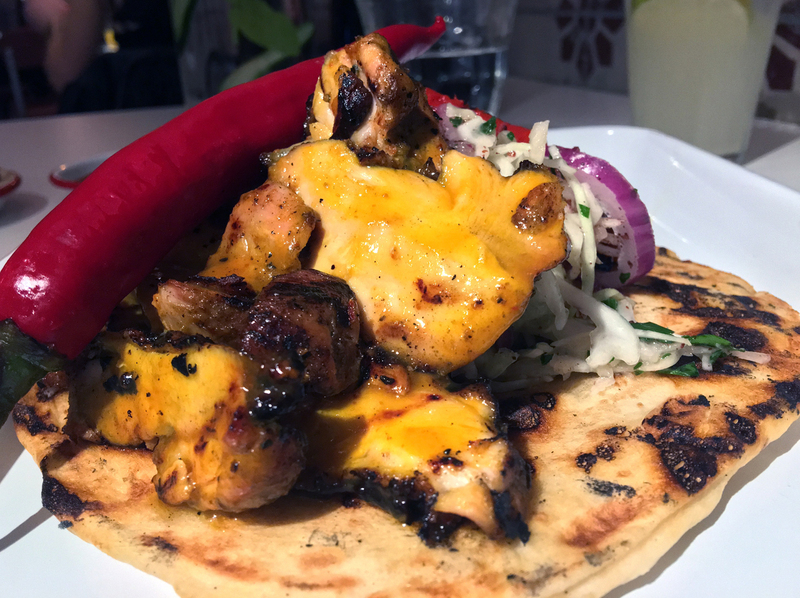 You can choose to have your kebabs at Bababoom accompanied by either flatbread or salad. The salad option consisted of a mildly tart and sharp coleslaw-like mix which, while far from memorable, was still preferable to the wilting, meagre fattoush which comes with all of Bababoom’s kebabs whether you want it or not. 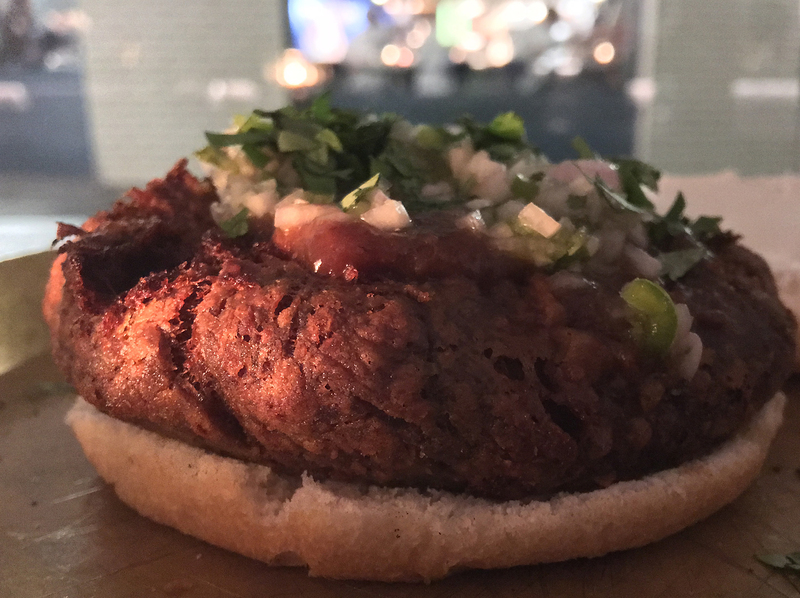 As with the ultimately misguided brisket kebab, the lamb variant took a kofte-like form. It was pleasing enough with its moist meatiness and the occasional hints of sour cherry and parsley. I found myself missing the sizzle and smoke of a charcoal grill and the gentle charring it can impart on a kebab when wielded skilfully. Without that, this otherwise traditional-ish Turkish-style kebab seemed oddly incomplete. There was no faulting the soft, tearable elasticity of the naan-style flatbread though. Why hasn’t anyone attempted a sour cherry-infused kebab before? Chicken shish had a vague scent of saffron and a transient smokiness. The dominant flavour was the OJ-like fruitiness. This wasn’t bad, but neither was it complex or satisfying enough to disguise the thin shreds of poultry which manage to pull off the impressive feat of resembling doner more than they did shish. The optional hot sauce was only moderately spicy in the grand Scoville scheme of things, but there was still enough prickly warmth to liven up this ho-hum shish. 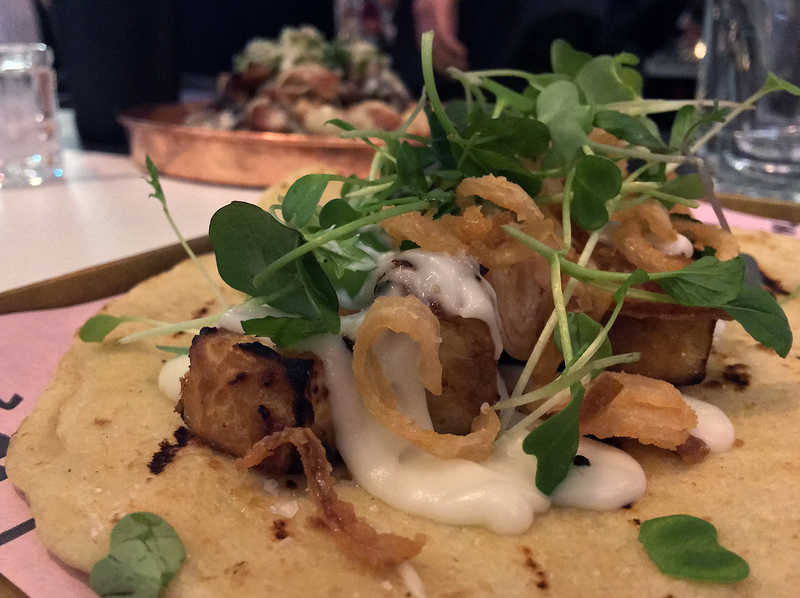 The accompanying flatbread was as good as ever. 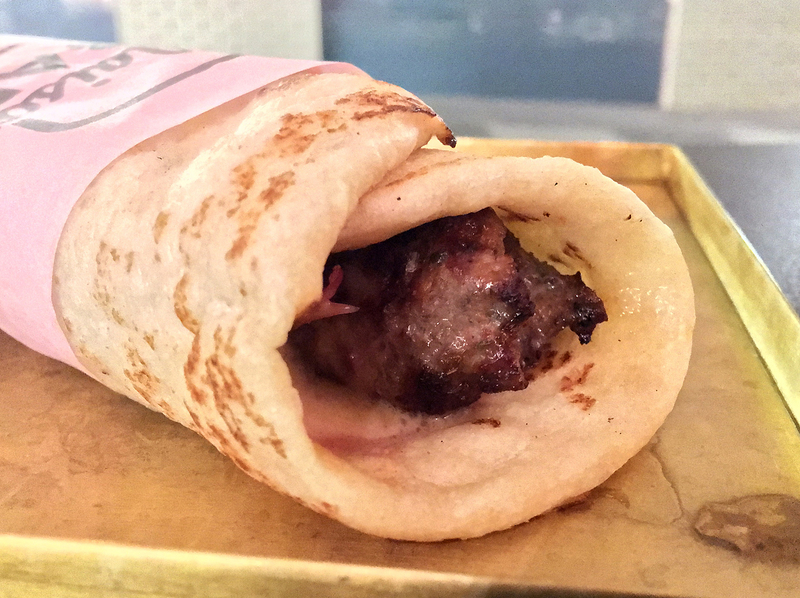 The mutton kebab proved to be one of Bababoom’s best. The meat resembled lamb, but denser and with more earthy, fatty oomph. As ever, the superlative flatbread was a fine accompaniment. We’re off to mutton moon! 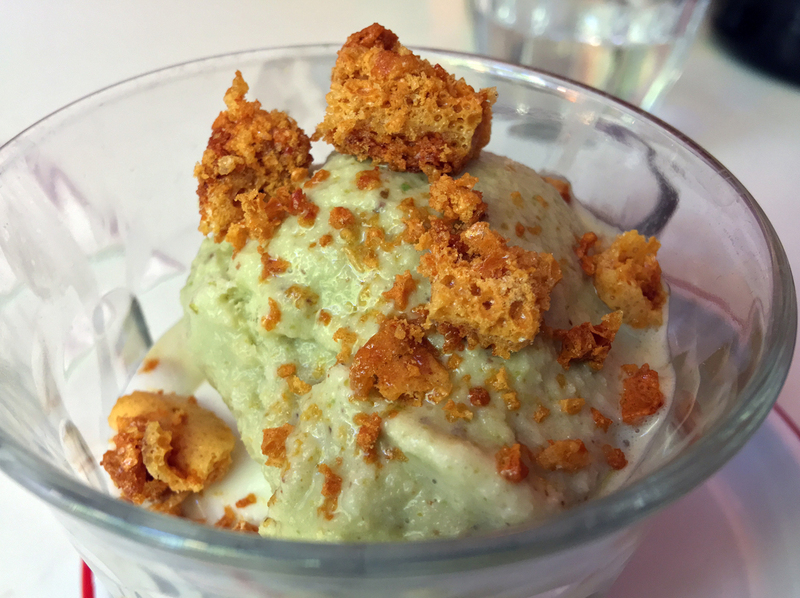 I usually hate sundaes, but Bababoom’s version intrigued me – on paper, at any rate. The ice creams were smooth and refreshing, even if its vanilla and pistachio flavours were lacking. 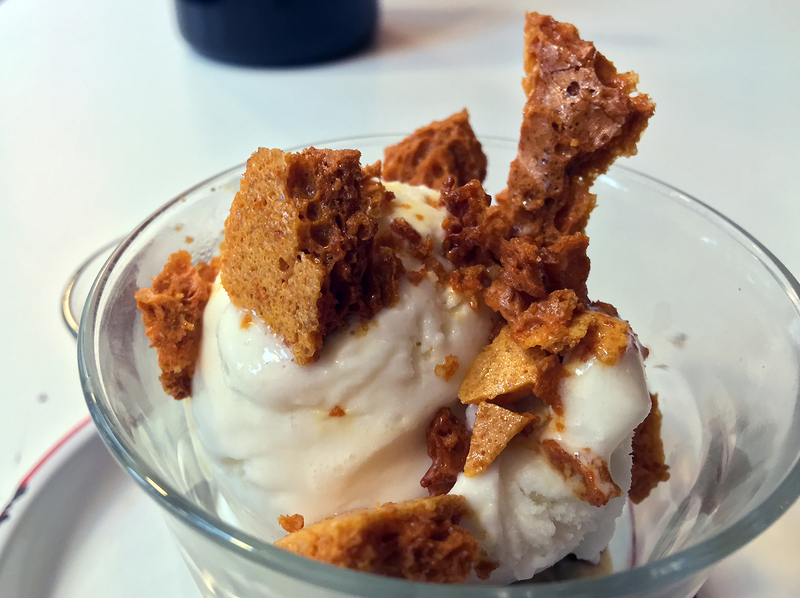 The honeycomb pieces were crunchy, lightly sweet and not at all cloying, while the date-based syrup was malty and molasses-ish in its sugariness. Each element was fine on its own, but cancelled each other out when taken together. It failed to come together as a successful, cohesive whole. You’re probably better off going to the branch of Udderlicious next door. At first glance, Maison Bab draws from a more wide-ranging, dizzying and almost incoherent range of influences than Bababoom. The real difference, though, was apparent as soon as I opened my maw. The mutton curry was easily good enough to rival the curries from most Indian restaurants. Dense, sinewy and moreish meat was suffused with a ‘dry’ rub of cumin and cardamom, the delightfully mellow warmth of the spices lingering on my lips even after the mutton had been devoured. This curry pushes my muttons. 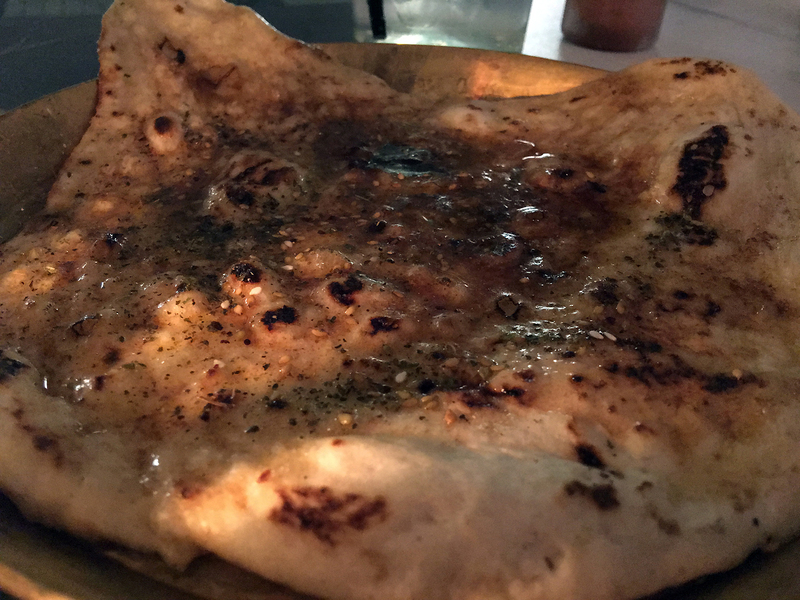 The tearable, elastic and pliable folds of the meat butter naan is certainly worth having, either on its own or with the mutton curry. 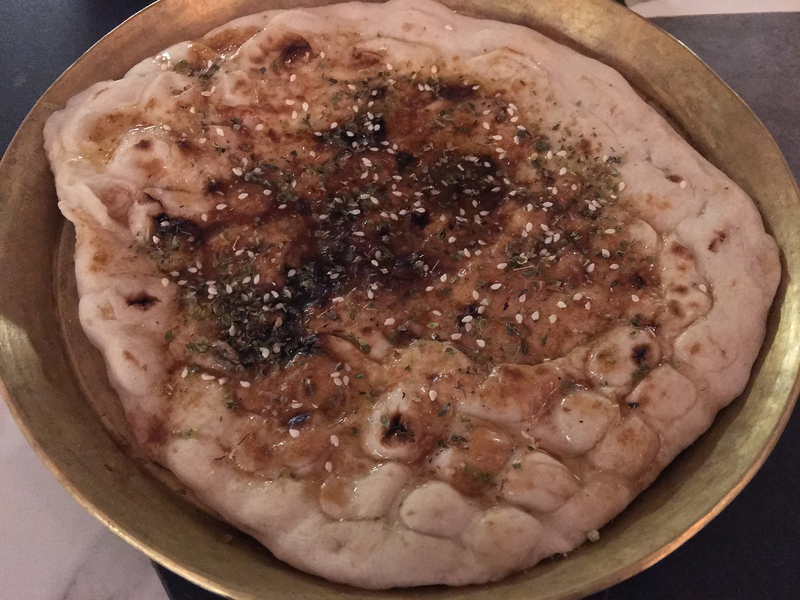 The ‘meat butter’ was, to my lips, a cross between ghee and beef dripping – a slick, moreishly meaty kiss that was destined to be enjoyed on this naan. …but, every once in a while, they can be signifiers of good times. 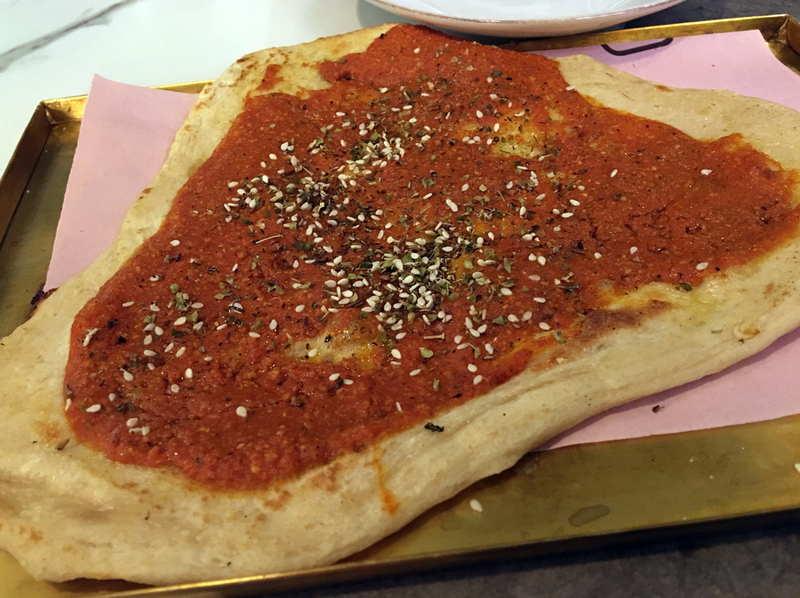 The quality of the naan can be surprisingly variable – the bread component of the marinara naan was disappointingly thin and stiff. The tart umami of the marinara sauce was pleasing though, neatly offset by a dusting of oregano. Halfway there to a pizza. 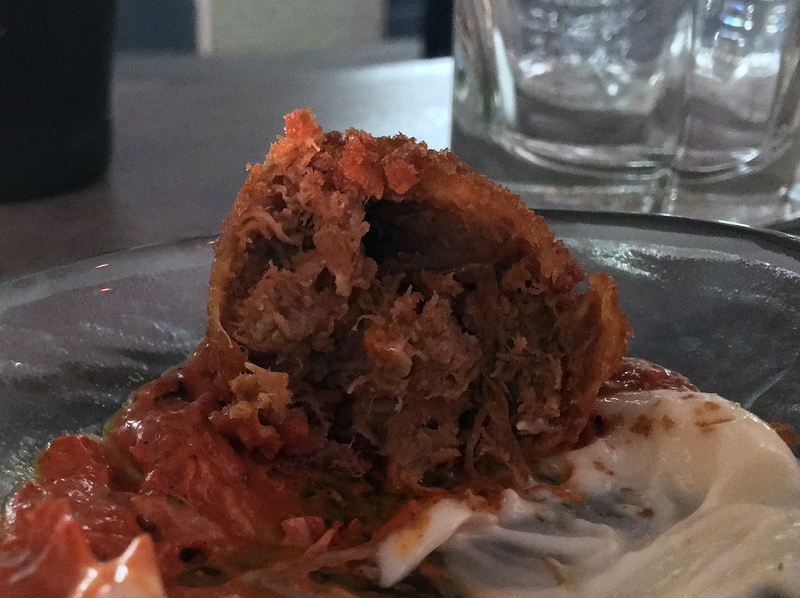 A croquette of doner meat was technically excellent – a crisp crumb shell with a sinewy, meaty interior. A spicy tomato sauce and refreshing yoghurt on the side were apt accompaniments. 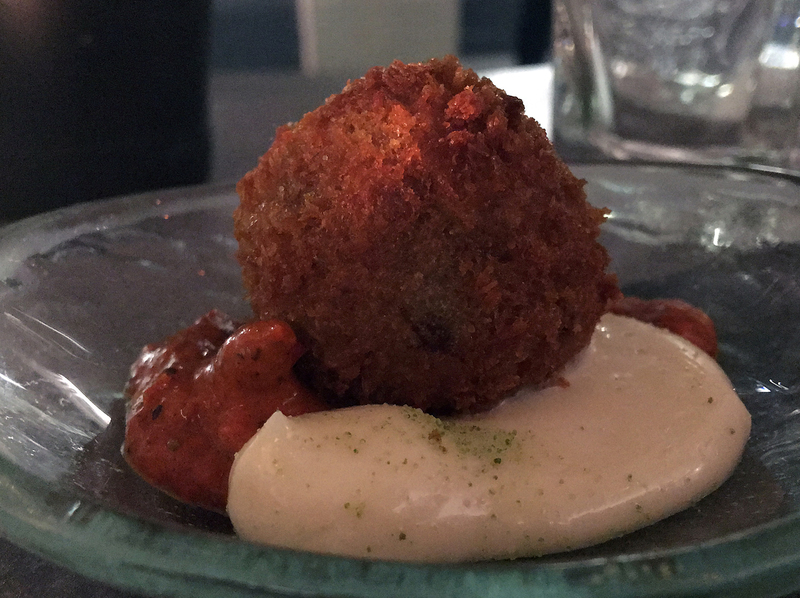 But that’s ‘croquette’ in the singular, which would be meagre for a bar snack or tapas dish neither mind a starter. Beignet, croquette, let’s call the whole thing off. 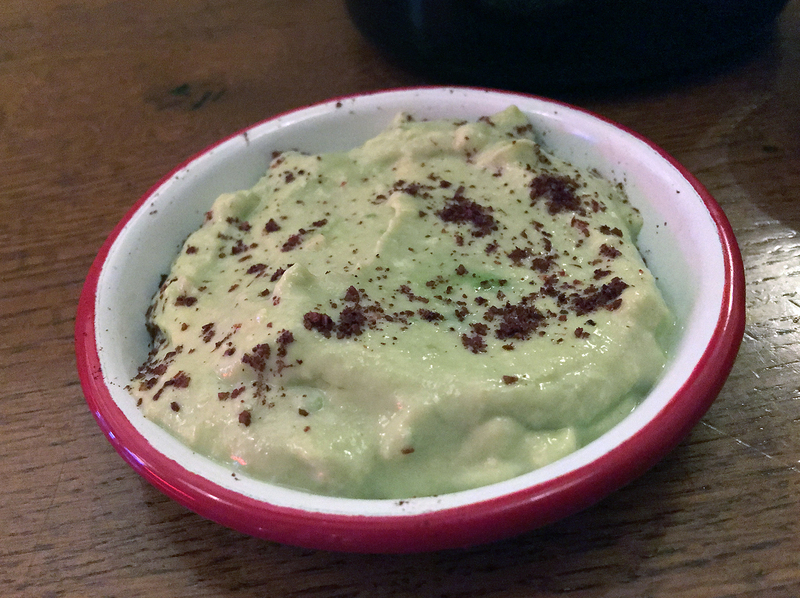 Maison Bab’s hummus wasn’t anywhere as thick and paste-like as the supermarket versions. It was far smoother and creamier, its nuttiness enhanced by the otherwise odd addition of whole peanuts. 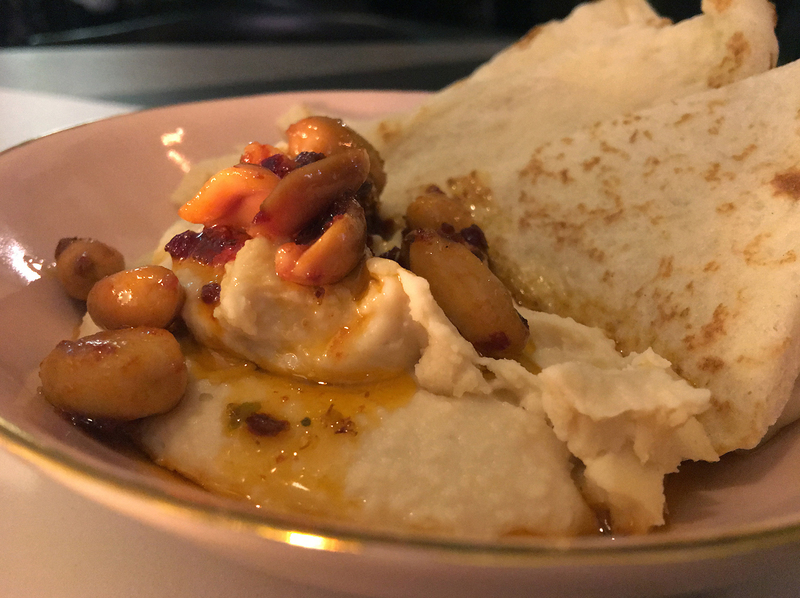 The soft, floppy pitta pieces were a poor companion though – neither stiff enough for scooping nor sliced widely enough for plucking the chickpea goodness. 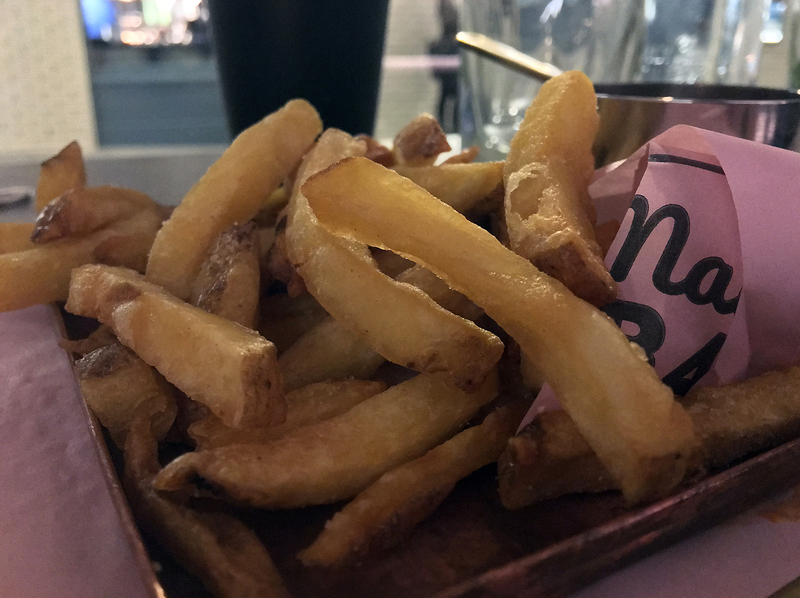 While the fries were as thin and reedy as the ones at Bababoom, they were far more pleasing with their perfectly even golden crispness. I was unconvinced by the tart tomato Iskender sauce on the side though. It would be perfectly fine as a base sauce, but it was far too one-dimensional to serve as a table condiment. 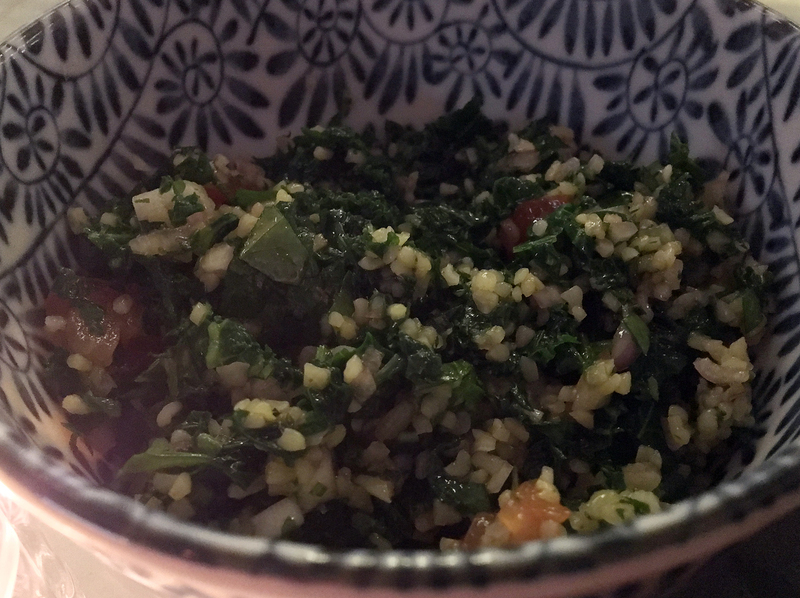 Kale tabbouleh was the perfect counterpoint to Maison Bab’s relatively heavy mains. The combination of crisp, juicy tomatoes, lemon juice, moreish bulgur wheat and bitter kale proved eminently refreshing. The words ‘kale tabbouleh’ will make narrow-minded types break out into hives, which is reason enough to order it if you ask me. 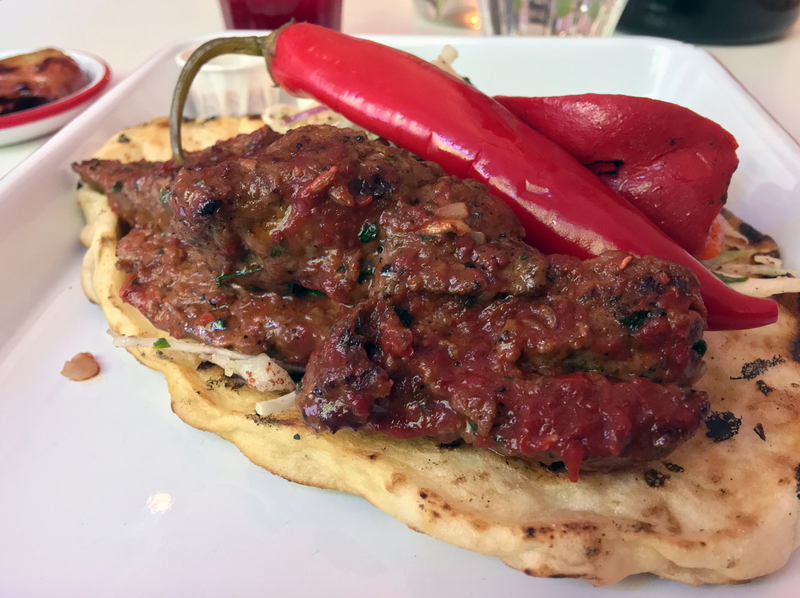 Maison Bab’s lamb kofte may be one of the more traditional kebabs on the menu, but it’s easily good enough to hold its own against the best that Green Lanes has to offer. Juicy, smoky and with a hint of parsley in its meaty veins, it came wrapped in a flatbread that had more in common with Maison Bab’s naan than the thinner, stiffer dürüm or the fluffier ramazan pide. 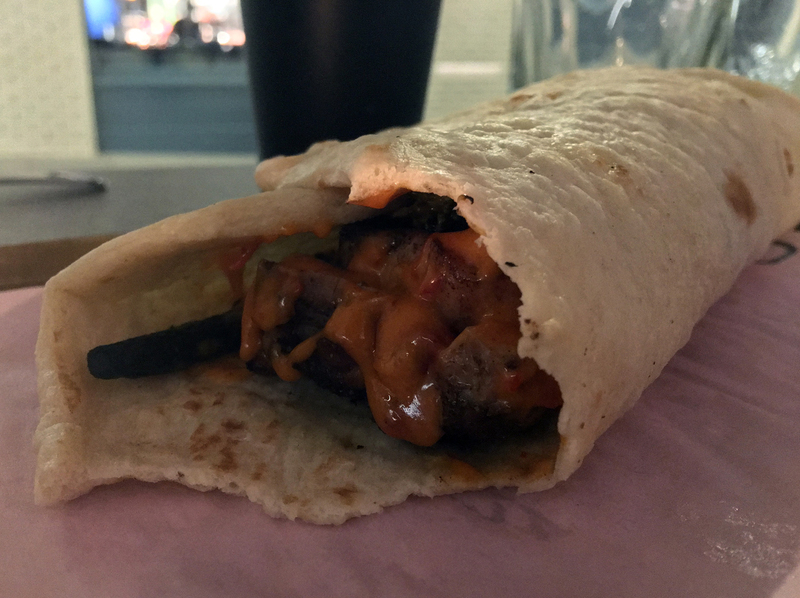 It wasn’t wrapped tightly enough to stop the meat juices dribbling out, but it was a nonetheless integral part of this joyous kebab. Wrap up snug. Winter is coming. I was initially unconvinced by the chewy, surprisingly bitty pieces of chicken shish. Its smoky chewiness grew on me though, especially as the bitter, firm stalks of the tenderstem broccoli proved to be surprisingly apt, both as a compliment and a contrast to the qualities of the chicken. The flatbread was just as good as the one that enveloped the lamb kofte. Broccoli in a kebab. Wait, come back, don’t run away. 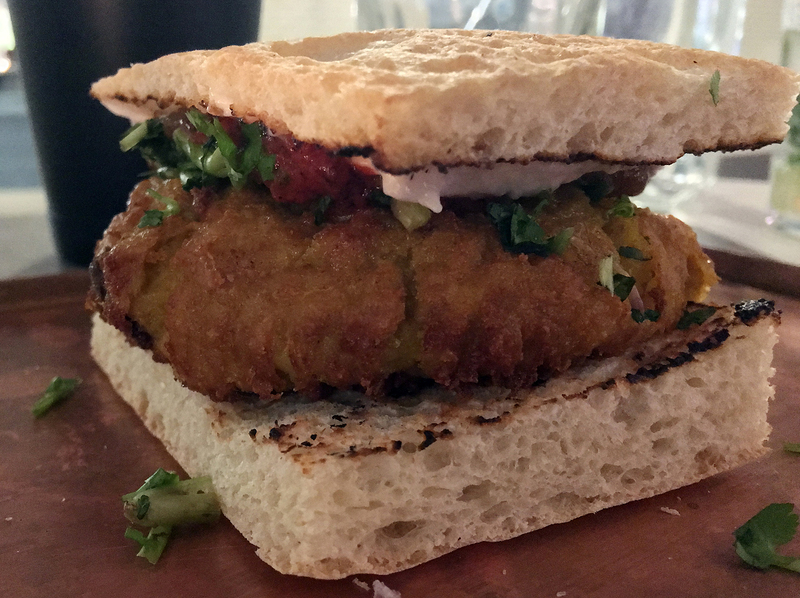 The finely ground, loose crumbed beef patty of the shami kebab was almost as reminiscent of an American sloppy joe as it was of anything from the Indian subcontinent. It proved to be a disappointingly unsatisfying affair from the loose and grainy texture to the non-existent spicing. The squidgy soft bun didn’t have much to say for itself, but it was absorbent enough to stop the beef from spilling out. This review’s procrastination was brought to you, in part, by shopping for a new winter coat and a fresh supply of knickers. 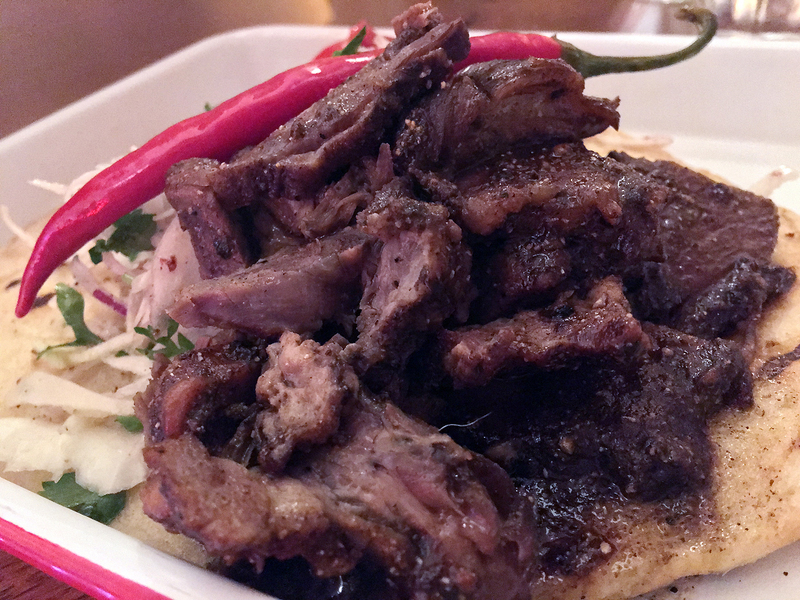 Pork shawarma can be had in two different dishes at Maison Bab. Neither was especially porky, but the ‘standard’ pork shawarma served on a naan still had plenty going for it. The peppery, moist and charred pieces of meat came topped with a zingy combination of sprightly sauce and tart sauerkraut-like veg. Only the surprisingly rubbery naan let the side down. Raclette shawarma wasn’t as decadently cheesy as I was expecting, with the raclette accenting rather than drenching the meat. The modest savoury meatiness was given a much needed boost by the lip-puckering pepperiness of the hot sauce and the tart sourness of the sauerkraut. The focaccia wasn’t bad, but its thick doughiness was clearly a work in progress. 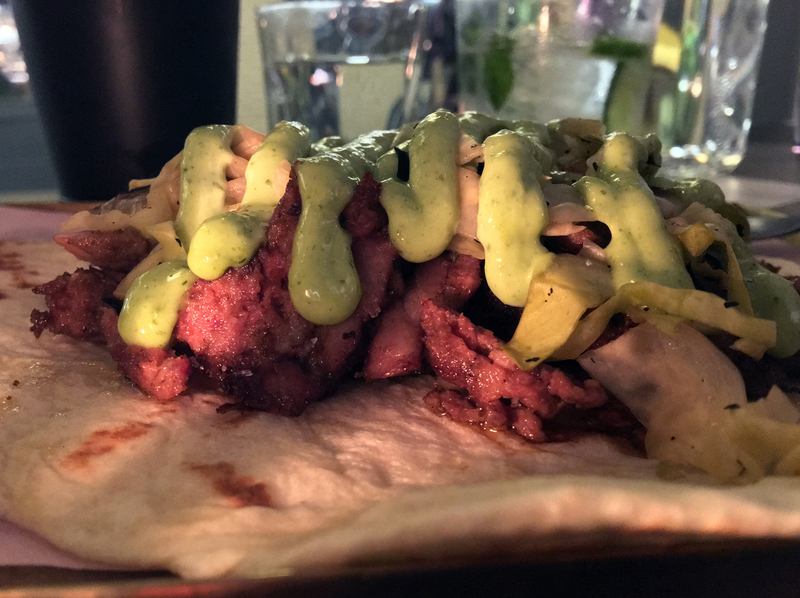 The mutton kebab proved to be an unexpectedly better take on shawarma. The thin slices of meat had a fatty bacon-like quality, but it was never overwhelming thanks to the citrusy pickles. Fried shallots were unexpectedly tangy, akin to pickled onion Monster Munch, providing not just another counterweight to the fatty mutton, but a touch of whimsy too. If only the same deftness had been applied to the naan, which was excessively tough and chewy once again. Now I have a craving for pickled onion Monster Munch. Maison Bab had an unexpectedly credible array of vegetarian mains, especially for a kebab restaurant. Crisp cubes of starchy sweet celeriac received a seamless boost of creamy umami from a squirt of weaponised miso. 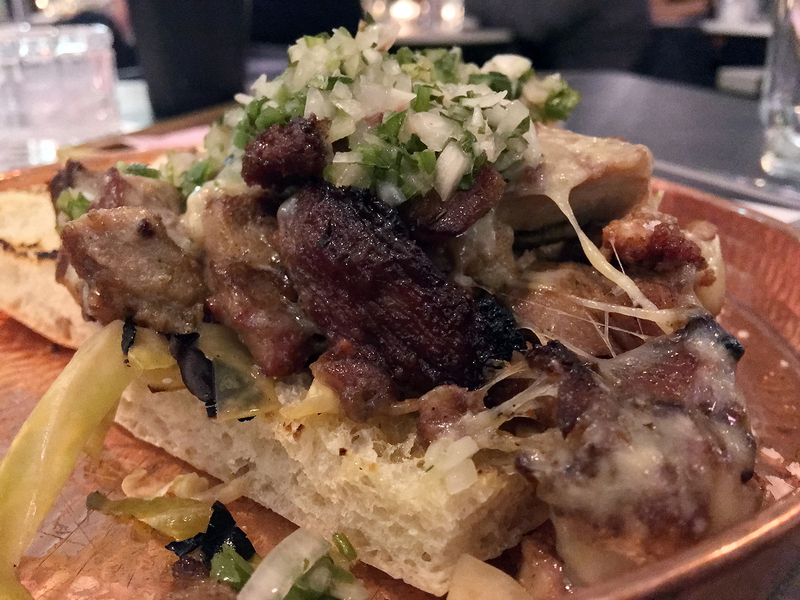 Wrapped in a soft and elastically tearable flatbread, it was not only the equal to the many meat dishes here but also their superior. This makes it all the more disappointing that this celeriac kebab is, at the time of writing, off the menu (due to its apparent unpopularity according to a staff member I spoke to). The sooner it comes back, the happier I’ll be. Hell really is other people. The celeriac kebab’s place is currently occupied by a sabich. 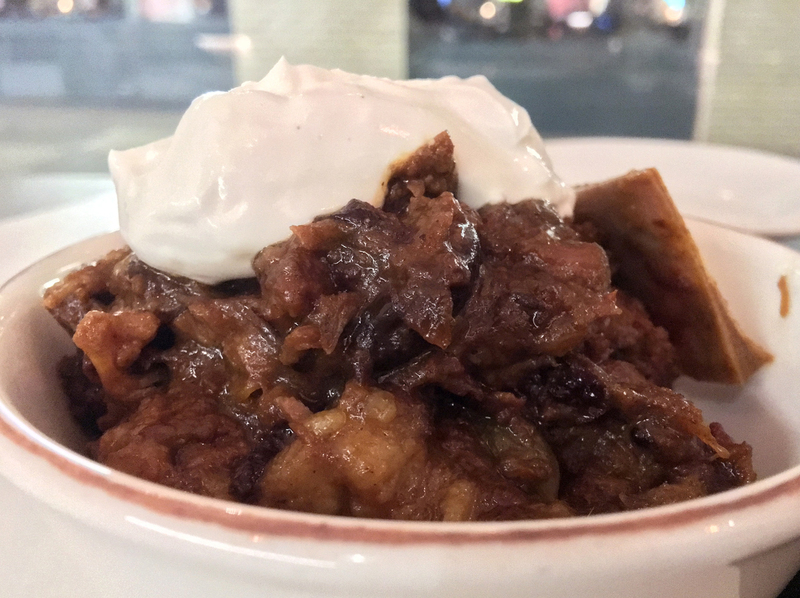 Although the aubergine pieces lost much of their fleshy mouthfeel due to the thin slicing, it was far from a dud with its smoky creaminess topped with a crisp, fruity garnish. The focaccia was finally on form with a crisp airiness that also provided an apt contrast to the tenderised eggplant. Crisp, ethereally soft focaccia acted as carrier for a fluffy, hearty potato fritter that just stayed on the right side of stodge. Given this relatively blank canvas, it’s a shame the spicy sauce was only modestly tingly. Disclosure: management insisted on deducting the cost of dessert from my bill on two separate occasions. This was accepted only out of politeness. There only ever appears to be one dessert available at Maison Bab, changing occasionally. 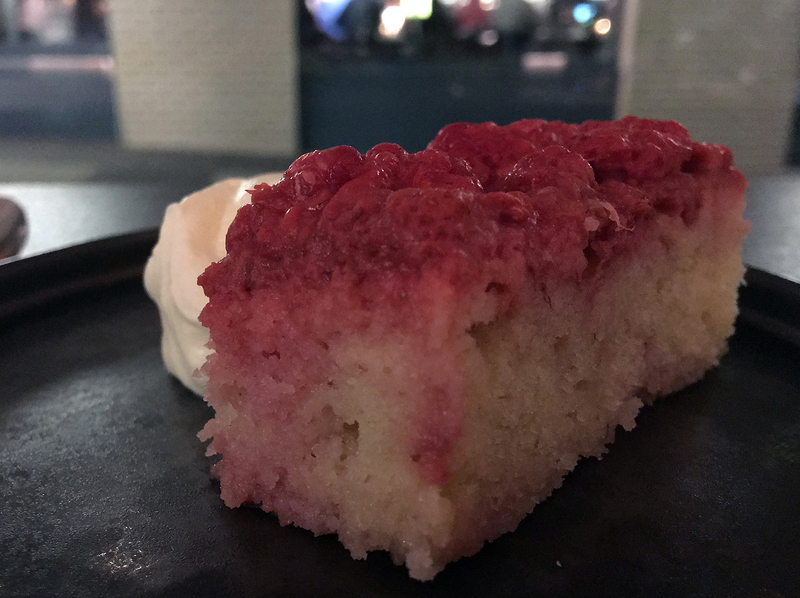 The late summer saw a raspberry cake take the limelight with a moist, dense crumb and a scarlet topping true to the fruit in its crisp sweetness. Thick and sweet creme fraiche on the side was the proverbial cherry on top. 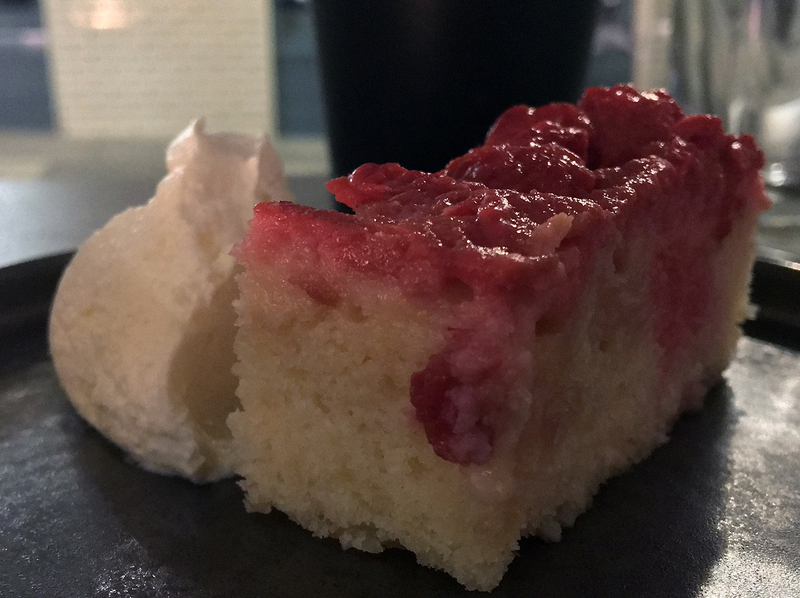 The raspberry cake was a delightful dessert across my many visits. I hope it makes a triumphant return next summer. Assuming the rapture hasn’t taken us all by then. Early autumn saw the raspberry cake replaced by a large fudge ‘cookie’. The gently crunchy crust gave way to reveal a fluffy, chewy interior, the whole thing drenched in a tangy, sticky fudge. 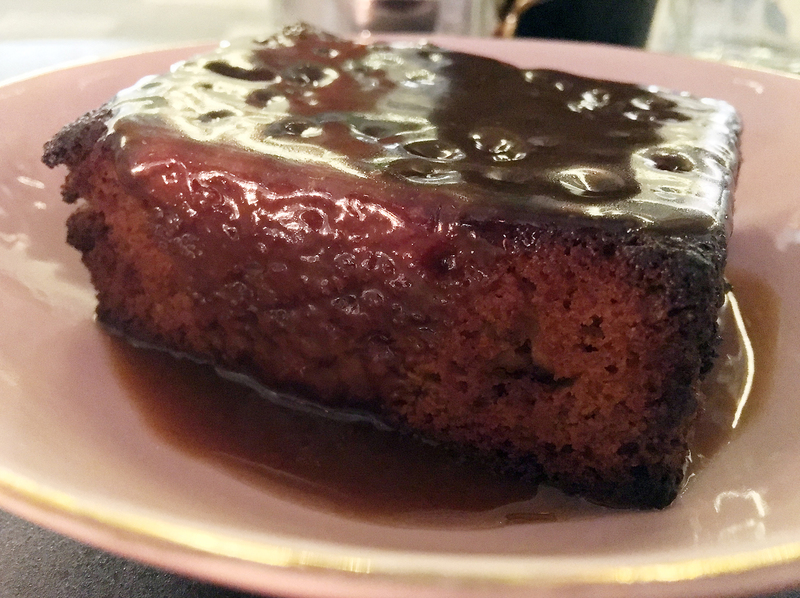 This dessert was as much a take on sticky toffee pudding as it was an embiggened cookie, even with the thin, milky cream drizzled on top. I have a pet theory that the most enjoyable kebab restaurants are the ones where you can hear the grill sizzling and can get a whiff of smoke and char. Eating, after all, involves more senses than just taste alone. Based on that smell test alone, Maison Bab would have the edge. While it’s not a complete trouncing, Maison Bab outclasses Bababoom in almost every way that counts. 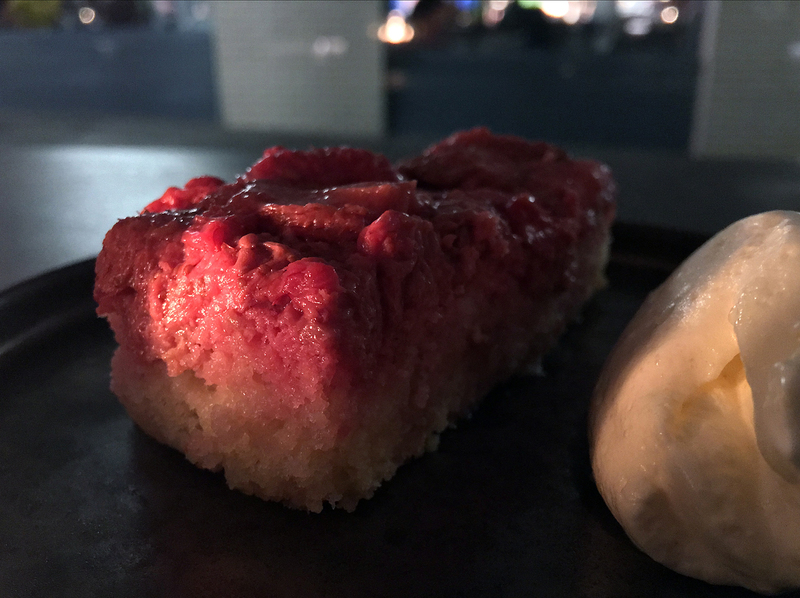 While Maison Bab isn’t an unequivocal success with a few missteps and outright duds here and there, its ravishing meat preparations sometimes exceed those of its immediate neighbour Temper Covent Garden. 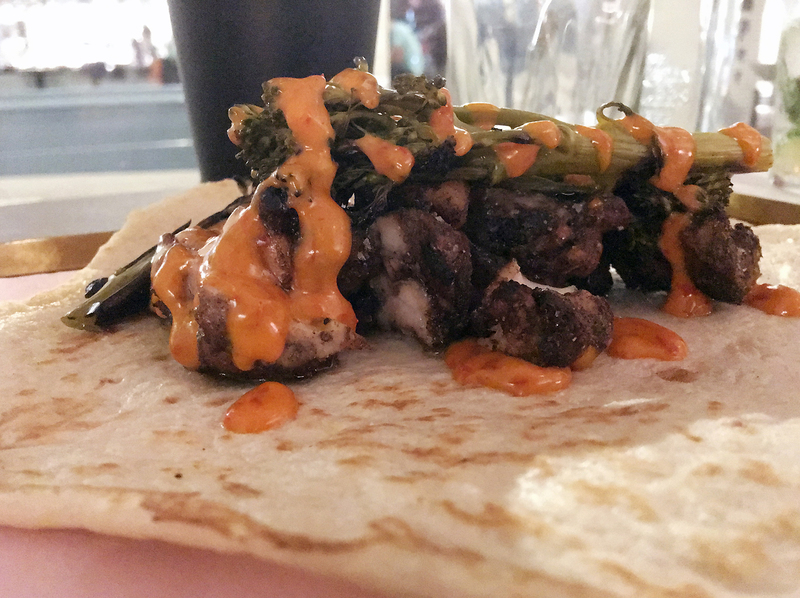 Bababoom is by no means bad, especially when it comes to bread where it was consistently excellent – an area in which Maison Bab clearly wobbles. But it fails to truly distinguish itself from old school Turkish kebab parlours, of which it feels like a faded whitewashed imitation. Maison Bab, on the other hand, is not only self-assured and inventive, it’s also genuinely fun. The kebab doesn’t need reinventing, just some fresh thinking every now and again to remind us how adaptable and timeless this evergreen culinary classic really is. By that measure, Maison Bab doesn’t have the final word but does have the most interesting things to say. I can’t wait to see where this conversation goes next. Opening Hours: Monday-Wednesday noon-22.00. Thursday-Saturday noon-22.30. Sunday 13.00-21.00. Average cost for one person including soft drinks: £37 approx. Opening Hours: Monday-Tuesday 11.45-22.00. Wednesday-Thursday 11.45-22.30. Friday 11.45-23.00. Saturday 10.30-23.00. Sunday 10.30-22.00. Reservations? probably a good idea on and around weekends. Tags: aubergine, avocado, bababoom, bacon, beef brisket, brisket, broccoli, cake, cauliflower, celeriac, cheese, chicken, creme fraiche, croquette, curry, doner, eggplant, falafel, feta, fish, fries, hummus, ice cream, kale, kebab, kofte, lamb, london, maison bab, mutton, naan, pickles, potato, raspberries, restaurant, review, sausages, shawarma, shish, sticky toffee pudding, sundae, tahini. Bookmark the permalink.